CDA’s range of cooker hoods & extractors offer beautiful aesthetic design and uncompromised performance. Extractors vary from the discreet, integrated models like our EIN60 to the striking EVG models. Each CDA extractor model has been thoughtfully designed and tested to work hard in your kitchen whilst looking fantastic. 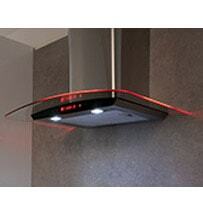 Your cooker hood can become an important part of your overall kitchen design by providing a focal point in the room. 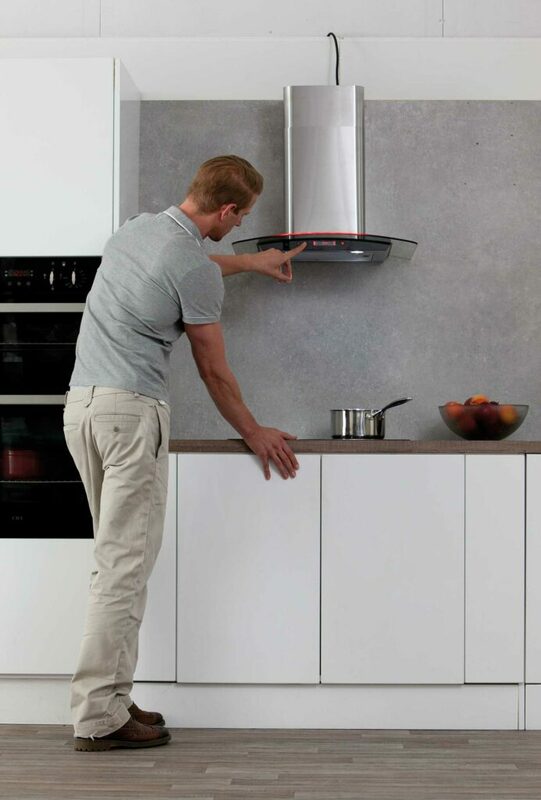 Cooker hoods and extractors are a stylish addition to your kitchen whether it is a big, bold chimney hood, or Whether it is a neat, discreet ceiling or downdraft extractor. With combinations of stainless silver and black glass the CDA range is perfect in any home looking to modernise or stay minimalistic. 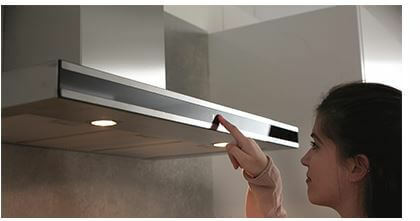 More than just a stylish focal point in your home, a cooker hood is a valuable and practical addition to your kitchen. If you like cooking but don’t want your home to smell of frying onions, garlic and spices then you will need an effective way to remove the cooking smells, grease and steam from your kitchen quickly and efficiently. They also come with integrated lighting to provide clear illumination over your cooking space. Simply opening a window is not enough when it comes to cooking grease and smells, once they cool they will stick to the nearest fabrics and surfaces in your home. In the average kitchen this could mean damp walls, greasy shelving and smelly seat covers and blinds. In an open plan home, pungent cooking odours could reach your living or even your sleeping areas quickly and can be difficult to get rid of. To save the never ending task of wiping down open shelving, the displayed items and degreasing cook books, a cooker hood is an essential piece of equipment in the home. The extraction quickly removes the grease, smells and steam through filters to duct it away outside or filter through cleansing carbon before recirculating it back into your home. Regardless of whether you’ve got a simple, standard 4 zone hob or a top-of-the-range (no pun intended) range cooker, when you’re cooking up a feast in your kitchen there is bound to be steam. Steam can be damaging for your walls and carries food odours that can cling to soft furnishings, which is why it’s important to try and keep it to a minimum. However, it’s not just steam that our kitchen hoods help to eliminate. The filtration system inside the extractors helps to remove smoke, odours, heat, fumes and even cooking grease. If you want to cut down on the cleaning in your home and remove the need to wash displayed crockery and cookware before you even use it then you need to keep your kitchen clean and grease-free. 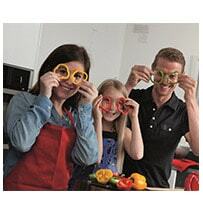 This helps to keep your kitchen a cleaner, fresher and more hygienic place to live. There are so many different styles to choose from, with options to suit every kitchen design and layout. We’ve designed models for island units, built-in and freestanding kitchen styles as well as minimalist ceiling options for a clutter-free space. 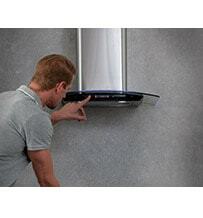 Our cooker hoods are efficient as you can adjust the speed they run at and also operate them on a timer. 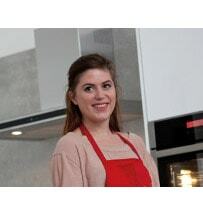 This means your extractor will automatically turn off after a set time when you’ve finished cooking. Allowing you and your family to enjoy the food you’ve whipped up, the extractor will continue to remove the nastiness that’s in the air, before switching itself off. It couldn’t be easier! Extraction rates can be quite puzzling and of course choosing the style of your cooker hood is very important. If you are stuck, have a look through the guide.